What does living in paradise mean? Waking up every day surrounded by natural beauty and architectural comfort? Of course, we all love our homes and think that they are beautiful! They have been decorated by us to our tastes and by our own standards—we probably wouldn't want to trade in our own homes for anything! But then we came across this home and we at homify decided that we just couldn't keep it to ourselves! Warning: you may feel slightly envious of the fortunate beings who live in this special home! This bright and luminous home is the epitome of luxury, style and elegance, where the extraordinary landscape has been taken full advantage of. 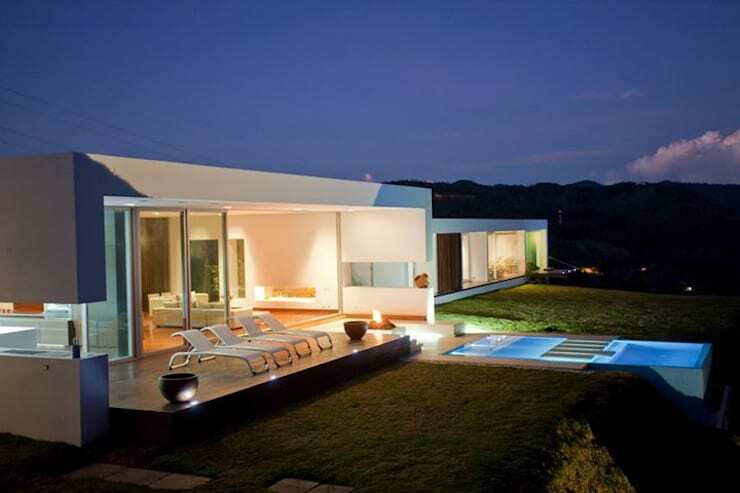 Located in Medellin, Columbia, it features entrancing lighting design as well thanks to the experts, Lighten. We could describe this home all day and it would still not be enough. We could praise the designers and lighting experts all day too, and it would be well-deserved, but that would just leave you feeling even more curious. So now it is time to see it with your very own eyes! Paradise in the light… at night! Our first view of the home is the same superb view of the home that we will see in the next image, but this time it is at night. We can see how the facade is completely enhanced by the spectacular lighting design. Situated in an isolated area, the only light in the surrounds comes form the home, highlighting it as a jewel among the landscape. Indirect lights have been carefully and cleverly placed in strategic and hidden spots to make the house even more beautiful, if that is possible. Couldn't you imagine having a night time game of cricket or soccer thanks to the light in the garden? And would there be a more idyllic setting? In the light of day, we can see that the home is elongated and spread across the horizontal space. It looks like it is only made up of one-storey, but in reality it has two floors. 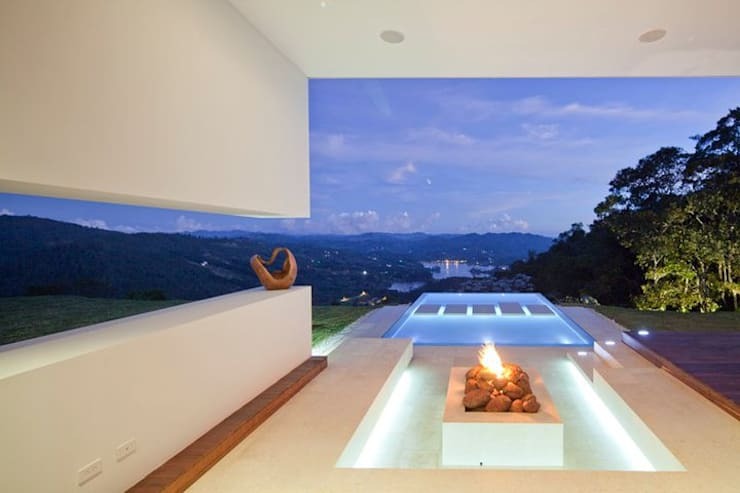 Situated on the top of a small mountain, the home has panoramic views of the entire landscape and surrounds and we can see that all of the facilities have been designed so that the inhabitants can enjoy the view to the full. In this image, we get a little glimpse into how the bottom facade has been perfectly integrated into the mountain where it nestles. We can also explore the beautiful roof swimming pool and deck that spills out from the upper level. This is a little piece of heaven right here in Columbia! If we zoom into the exterior of the home and move a little bit to the left, we can really see how incredible the swimming pool is as well as get a little peak into the interior. 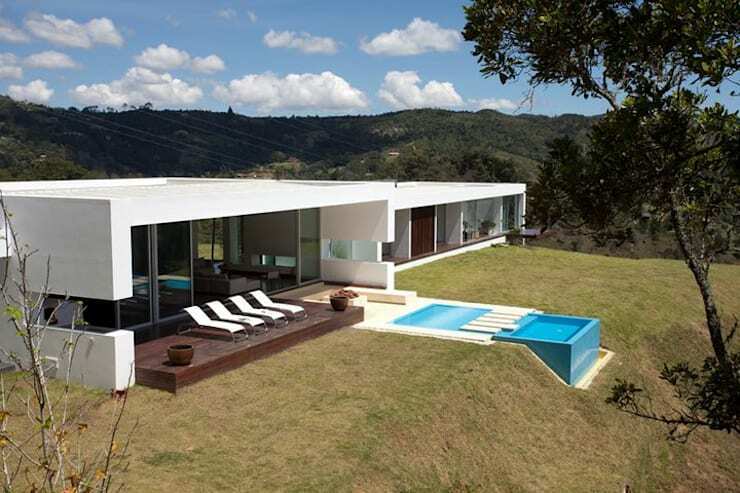 The modern architecture is evident as well as the seamless relationship between the interior and exterior environments. This is achieved by the extensive use of glass, which creates that fine line between the inside and outside. It also works to expand the large living room, integrating it with the leisure area outside. Are you already green with envy? Just hold on… there's more to see. Read on! Here we can see a real ethereal vision of the home, no matter what angle we look at it from! 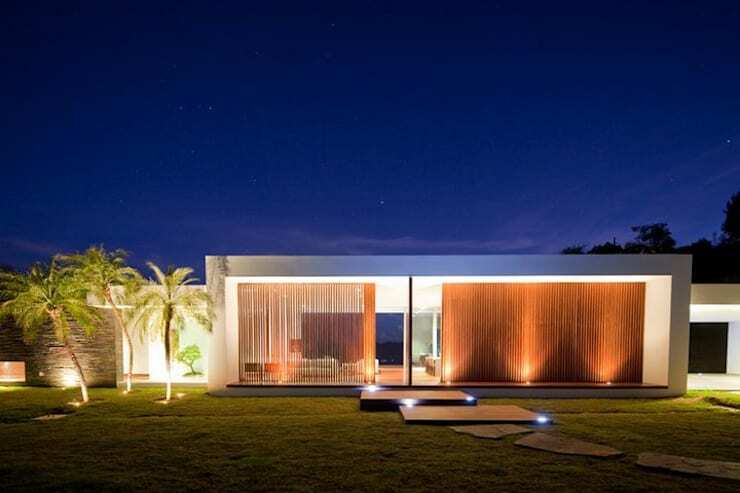 The light from the ground illuminates the home as well as the architectural elements of the landscape, including the palm trees and garden. LED lamps have been impressively used throughout this design! Even the large stepping stones that create a path to the front door have been subtly lit up from the bottom up, making them functionally visible as well as beautiful at night. A very successful lighting design adds much value to the architectural design and as we can see, goes far beyond the simple function of providing light! Does this landscape take your breath away? We have no doubt! The landscape can be enjoyed while taking a dip in the freshness of this crystal clear pool water—a luxury that seems to be a dream! 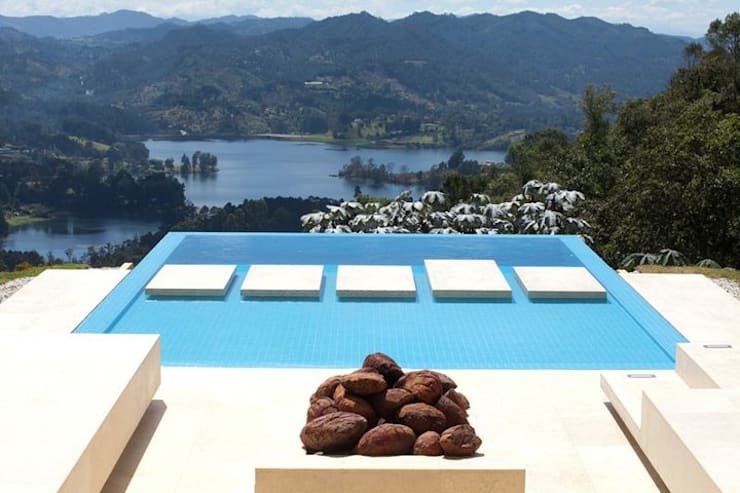 The sky is mirrored by the water of the pool and, combined with the lake in the distance, creates a delicious vertigo effect. If you're asking yourself right from the start what the cement blocks are for, which so perfectly adorn the pool, we can tell you that they form the partition between the more shallow side of the pool and the deeper side of the pool. 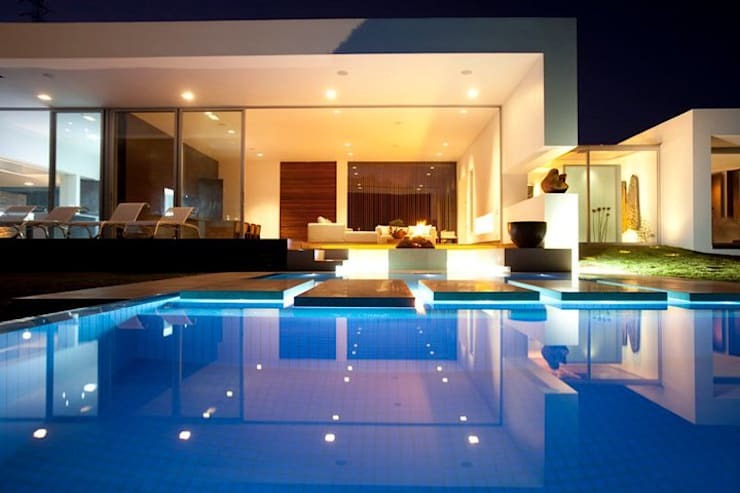 Have a look through the homify pool products for inspiration for your own swimming pool design. Don't you agree this is truly spectacular? At twilight the magic intensifies! Exploring the little inside pool leisure area, we come across this rare beauty. The intense blue of the setting sun reflects in the mirrors of the water and a small, electronic fire creates a warm and relaxing atmosphere, even in an open space like this. The hollow wall extends our view of the horizon, while still protecting the space from the breeze that is sure to flow every now and then through this tropical paradise. There is also a lovely piece of artwork placed here, enhancing the space. The whole picture exudes balance and harmony, but at the same time exudes a sensual energy that translates into a tangible setting. We dare to say that this is one of the most romantic places that we have every seen! One last photo before we unfortunately have to leave this amazing home. Here we can enjoy the unique and luxurious bathroom. It is impossible not to repeat the word beautiful here! The wooden floor gives a warm charm to this space, which is completely open to the outdoor landscapes and nature that surrounds it. The neutral colours and simplicity connect the two together. The jacuzzi, decorated in blue tiling, offers the exclusivity of a spa at home. And if you want a bit of privacy, you can just close the door! Love this space? 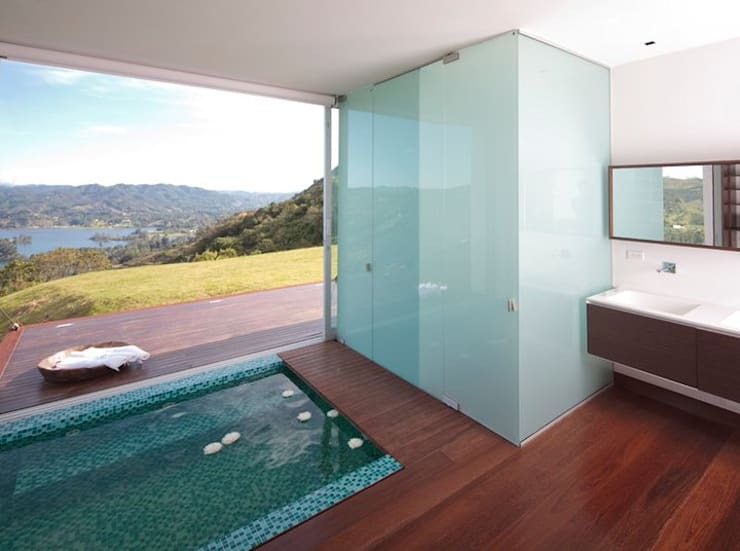 Have a look at these: Brilliant, beautiful bathroom trends. Does this home take your breath away?